Format: PDF of the score and parts emailed manually within 24 hours of purchase. Excited Utterance is not a commentary on law or our legal system; rather, it is simply named after a legal term that the composer found amusing and appropriate to the piece. 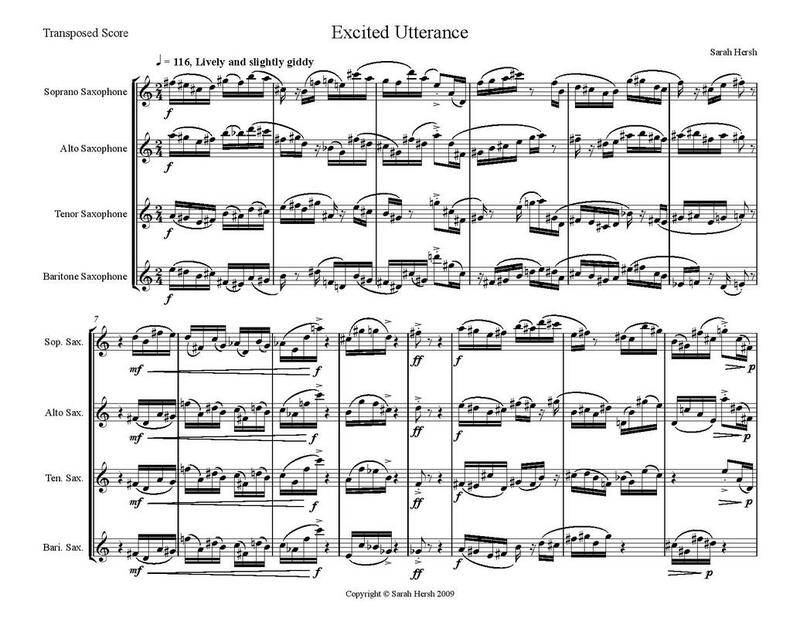 The piece is in rondo form, each time returning to the opening gesture when all the players make "excited utterances" together- that is, pure and honest utterances untainted by our own censorship or reflection. The piece builds from there as each section grows out of the previous one, while always returning to the initial "excited utterances". As the initial tempo marking indicates, the piece opens in a "lively and slightly giddy" way, which is how I imagine excited utterances should be. The mood darkens and becomes anxious, but always attempts to return to the giddy feelings of the beginning. As the piece goes on it becomes harder and harder to quickly return to the excitement of the opening statements, finally ending in a slightly more sober manner. The piece is alternately very lively and up-tempo, interspersed with slower, minimalist sections. A great piece to show off a talented saxophone quartet, as each performer has moments to shine in the spotlight. *Please note, this program note was written by a composer, not a lawyer, and therefore should not be interpreted as legal advice or construed to be legally or factually accurate in any way.